Who would win in an all out brawl? Captain America teamed up with Spider-Man, or Abomination teamed up with Doctor Doom? Now YOU can decide! 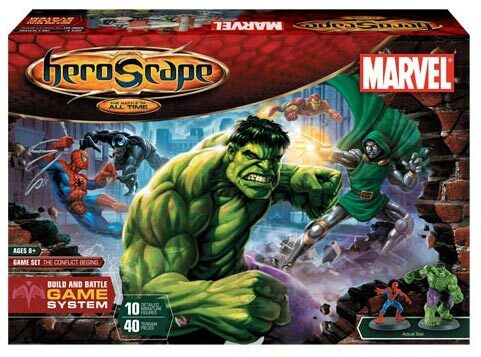 Marvel invades the Heroscape world in this exciting stand-alone expansion set. Choose from 10 different Marvel Super Heroes & Super Villains and clobber your way through your opponents using one of the pre-built scenarios, or build your own 3-D battlefield and pit your favorite Heroes & Villains against each other in ways you never imagined! And we have secured some detailed information on the Comic Heroes and Villains included in Marvel Heroscape: The Conflict Begins as well as an image of the box! This is a good one to add to your set. The marvel guys though at times are very powerful compared to the regular Heroscape Characters, but if you play it will come refined rules, this is a fun one to have. This set is awesome. The Marvel heroes and villain are very powerful so if you use them with other sets you really have to adjust point to make it even, but a great set to have.